Easy Calendar released a new week calendar iPhone app which, more than existing iPhone calendars, distinguishes between frequent and less frequent tasks. By significantly lowering the number of steps required to enter a typical appointment, it increases the usability of an iPhone as a day-to-day calendar. 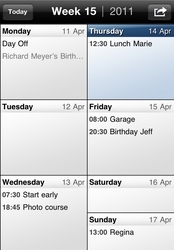 Easy Calendar integrates with the iPhone native calendar, by which it fully benefits from standard synchronization features. An interesting feature is the way events can be moved quickly using the week view itself. Now I can finally put my handwritten calendar aside. Thanks. Visit the easy-calendar.com for some videos comparing Easy Calendar with the native iPhone Calendar. A press kit is available at http://www.easy-calendar.com/press/press-kit.zip. For promo codes to support your review or other questions, feel free to contact Jos Jong (jos.jong(at)easy-calendar(dot)com). Add/Edit EventsJust date, time, and text for a typical appointment. Event OptionsAll other event properties available as options. 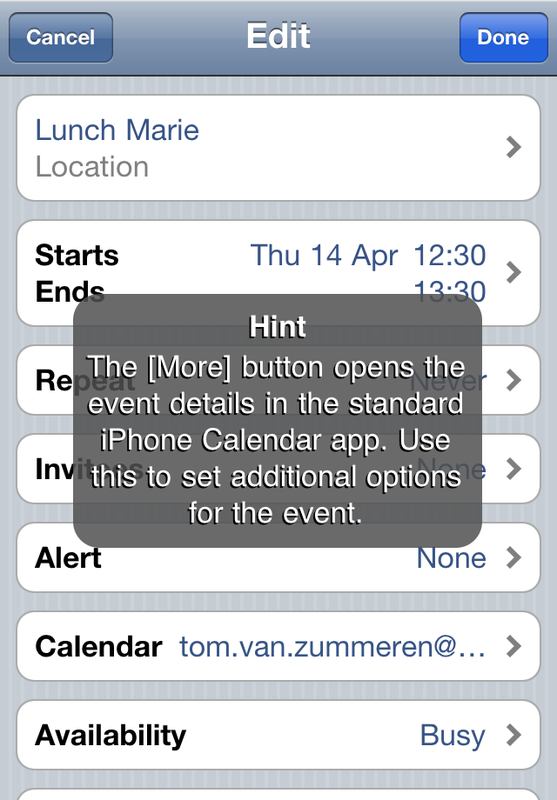 Move EventsBrowse through the calendar itself to select a new date.